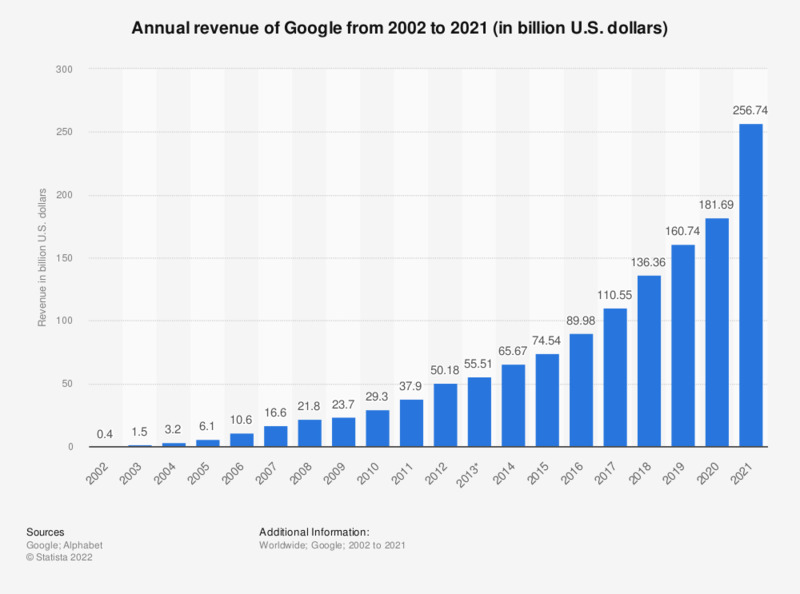 This statistic displays Google's revenue worldwide from 2002 to 2018. In the most recently reported fiscal year, Google's revenue amounted to 136.22 billion US dollars. Google's revenue is largely made up by advertising revenue, which amounted to 116 billion US dollars in 2018. As of May 2018, Google ranks first among worldwide internet companies, with a market capitalization of 510 billion U.S. dollars. Founded in 1998, Google is a multinational internet service corporation headquartered in California, United States. Initially conceptualized as a web search engine based on a PageRank algorithm, Google now offers a multitude of desktop, mobile and online products. Google Search remains the company’s core web-based product along with advertising services, communication and publishing tools, development and statistical tools as well as map-related products. Google is also the producer of the mobile operating system Android, Chrome OS, Google TV as well as desktop and mobile applications such as the internet browser Google Chrome or mobile web applications based on pre-existing Google products. Recently, Google has also been developing selected pieces of hardware which ranges from the Nexus series of mobile devices to smart home devices and driverless cars. Due to its immense scale, Google also offers a crisis response service covering disasters, turmoil and emergencies, as well as an open source missing person finder in times of disaster. Despite the vast scope of Google products, the company still collects the majority of its revenue through online advertising on Google Site and Google network websites. Other revenues are generated via product licensing and most recently, digital content and mobile apps via the Google Play Store, a distribution platform for digital content. As of November 2018, the highest-grossing Android apps worldwide included mobile games such as Candy Crush Saga, Pokemon Go, and Tinder.